Friday was the first real move bears have successfully pulled off in recent weeks, at least for the S&P and Dow. In the case of the S&P, there was a decisive undercut of 2093 and 20-day MA, with the index finishing just 9 points above its 50-day MA. As the latter moving averages offered little in the way of support in January or February, the likelihood it that we will see another challenge on the 200-day MA. Volume climbed to register a confirmed distribution day, and came with a technical bearish cross between -DI and +DI. 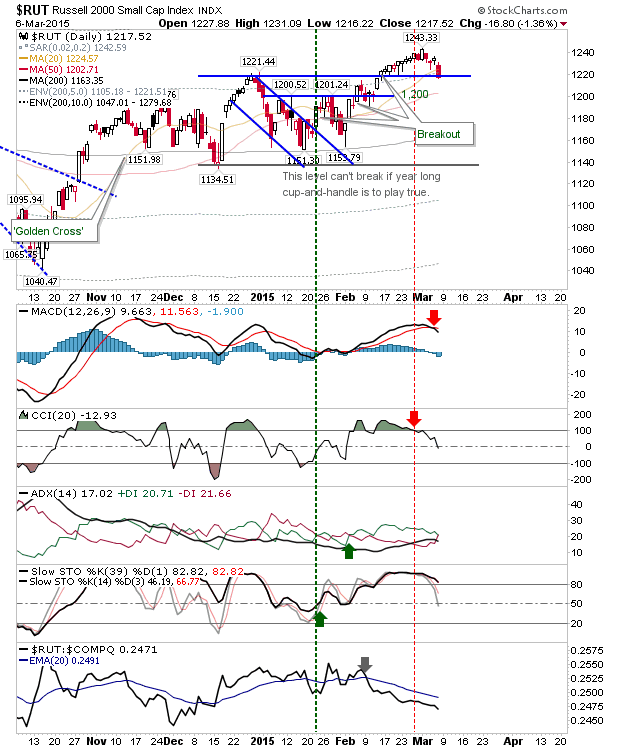 Any rally back to 2093 will likely get shorted on Monday. It was a similar story for the Dow as for the S&P, although it finished a little closer to its 50-day MA. Again, a move back to test 200-day MA would appear to be the preferred next step; rallies back to 18103 will likely be sold against. 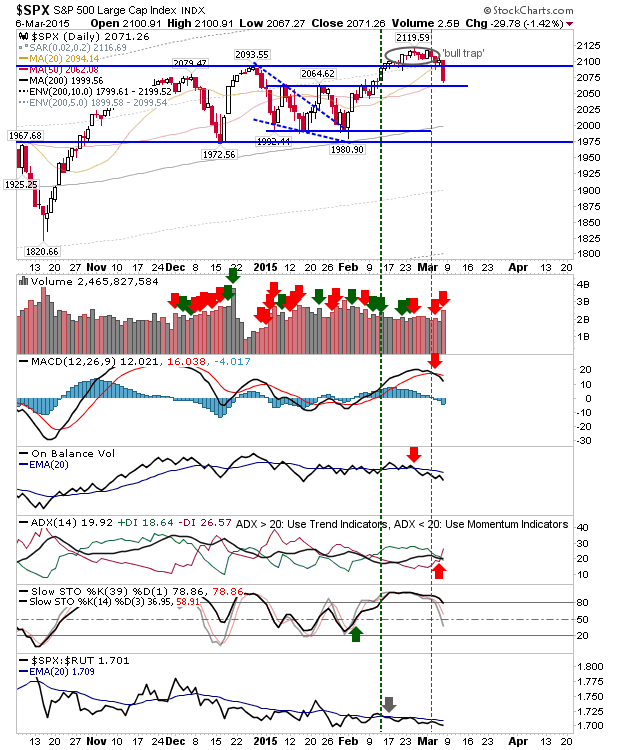 The Nasdaq took a hit alongside Large Caps, but it remains well above support and successfully defended its 20-day MA. 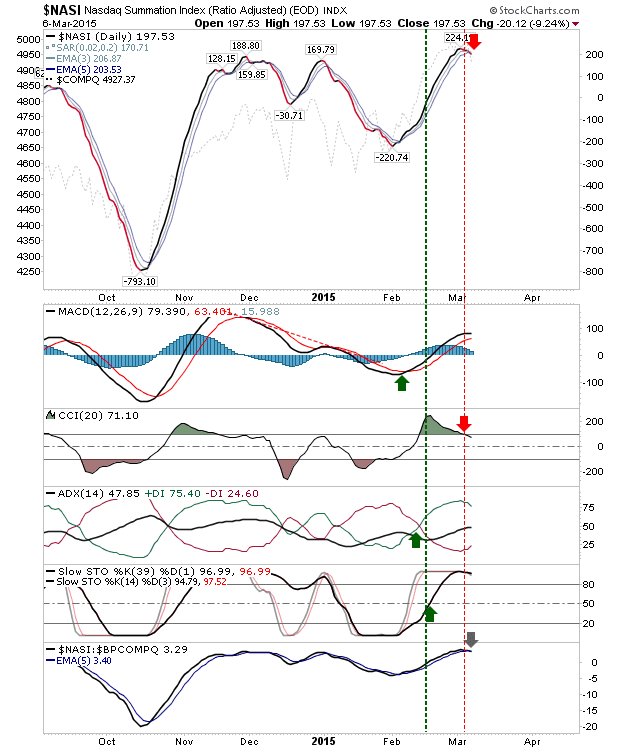 The index triggered a 'sell' in the MACD. The Nasdaq Summation Index turned a 'sell' trigger, along with a 'sell' in the relative relationship between the Summation Index and Bullish Percents. The last time there was a 'sell' in this relationship the Nasdaq headed lower. The Russell 2000 closed below its 20-day MA and just a shade below breakout support. Any further loss on Monday would confirm, although aggressive buyers could use this as an opportunity to go long. 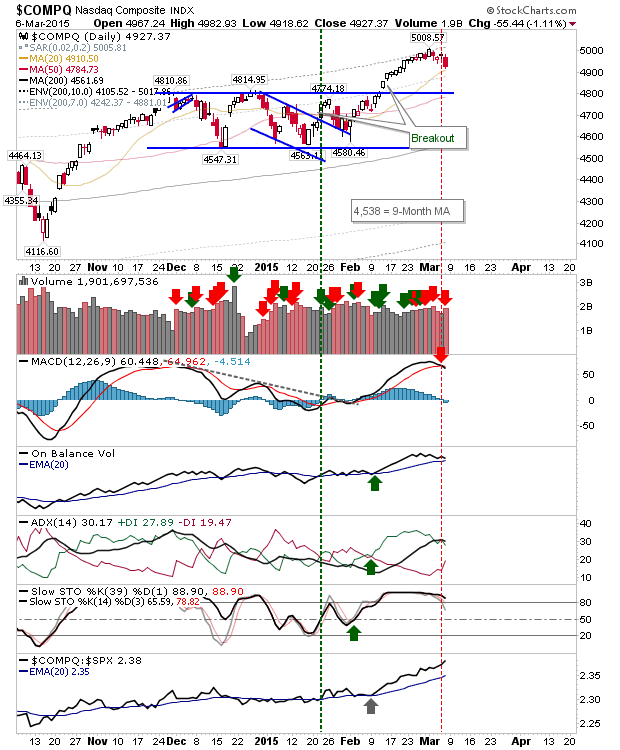 There are bearish technicals, perhaps enough to keep some buyers out for now, but ready to participate when technicals recover. 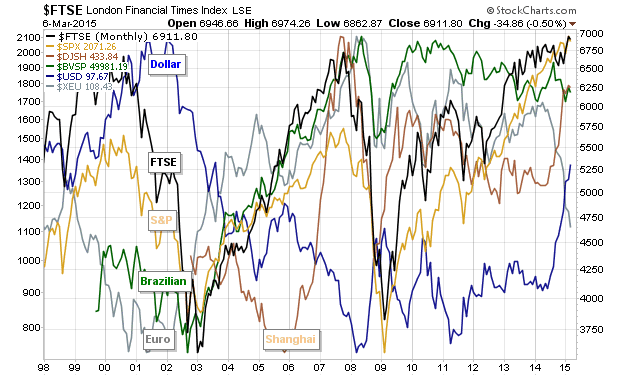 The relative-indices tracker shows a FTSE and S&P at peaks, a dollar in rally, and a euro in decline. A strengthening dollar eventually hurt the indices in 2000/01, but indices peaked in 2007/08 on the back of a weakening dollar. In either case, the rally in the dollar/decline in euro doesn't look done. For Monday, look for a rally in the Russell 2000 and Large Cap indices. 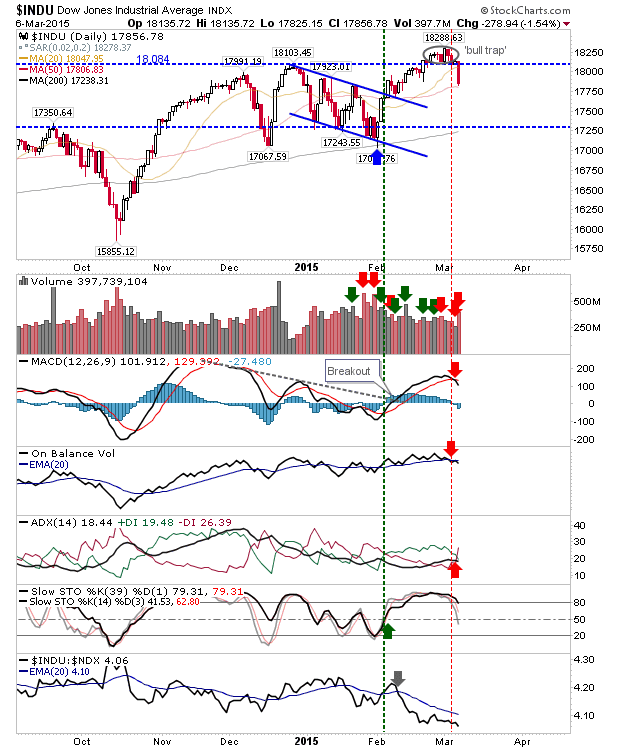 Rallies in the latter may be shorted as they approach former breakout support, turned resistance. However, bull strength in the market would likely best reward Russell 2000 traders.